A couple of months ago, eight armed men raided, Supper Cell Estate, an upscale residential estate located in Apo area of the Federal Capital Territory, FCT, Abuja, unleashing terror on its residents, killing two persons, including a pregnant woman. Two other victims sustained life threatening injuries. Among those injured, was the husband of the pregnant woman who lost his two legs during the robbery operation, with a middle-aged woman, Glory Uzoh, who relocated recently to Abuja, from Lagos State. 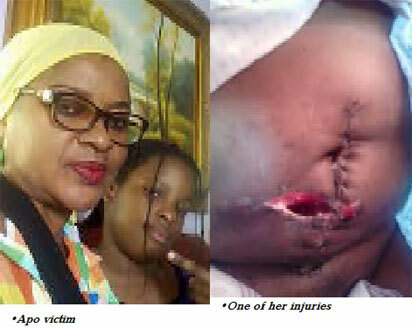 The robbers shot at her twice; one in her abdomen and the other, on her arm. Uzoh, could not have been luckier as the bullet which penetrated her abdomen, also damaged her intestine, before pulling out from her back. Pregnant-victim Saturday Vanguard gathered that the gang behind this carnage was led by a notorious armed robber, Denis Avaugwa, a native of Kastina Ala in Benue State. The 24-year-old who was said to have been arrested twice for armed robbery and was remanded at the Kuje Prison in Abuja, formed a new gang in 2014 after he regained his freedom. The robbers, armed with three AK47 rifles and four locally made revolver rifles, were said to have carried out several high profile armed robberies around residential estates in Abuja, where they carted away huge sums of money, exotic cars, jewelries, laptops and mobile phones. They were said to have gruesomely murdered six Fulani herdsmen who they met in a bush while escaping from a robbery scene in Lugbe area of Abuja. It was gathered that the gang, after raiding some apartments in Gold City Estate, Luge, escaped through Pyakasa. The robbers, on sighting the herdsmen sleeping by the road side, they opened fire on them and killed all of them on the spot. It was learnt further that the gang leader, Ava, as was fondly called by his colleagues, ordered the killing of the herdsmen in retaliation for their activities in his state. But after the November 2015 carnage, Inspector General of Police, Solomon Arase, deployed his elite operatives, from the Special Intelligence Response Team, IRT, to track down the bandits and bring them to book. Sources disclosed that after gathering sufficient intelligence, the IRT operatives, led by CSP Abba Kyari stormed Nassarawa, Plateau and Bauchi States in search of these bandits and those who had links with them. Eight suspects, including the gang’s financier and also their arms supplier, were identified as Ibrahim Suleiman, a.k.a, Scorpion, Jonson Aikko, a.k.a, Stigma, Pius Gabriel, a.k.a Double Spirit, Rabo Yakubu (arms supplier), Oladimeji Ikotun, (stolen goods, vehicle receiver and financier) Umaru Nda, Matthew Ofe and Nicodemos Shittu and were all rounded up by the IRT operatives. While Ava and Ogbona Chidubem, a.k.a, Oyibo were equally arrested by men of the Special Anti-Robbery Squad, SARS, attached to the FCT Police Command. A few days ago, Saturday Vanguard had a chat with these suspects, except Ava and Chidubem as they weren’t available as at the time this interview was conducted. Stigma who told Saturday Vanguard that he was the third in command after Ava and Nautica who is yet to be arrested, narrated how the gang was formed, their robbery exploits and how they grew into a dreaded gang robbers using AK 47 rifles. “How I joined the robbery gang” Stigma said; “I am Jonson Aikko, but my friends call me Stigma. I am 30-years old from Benue State. I had only primary education and I am a bricklayer. I came to Abuja in 2009 and I was staying at Gwagalada area of Abuja and I was doing my job there. But my story changed in 2014 when I became friends with two boys from my State, Ava and Nautical. I met these boys on the same day in a bar in Masaka, Nassarawa State. They bought me drinks and we became friends. I told them that I was a bricklayer and they told me that I was strong and I could make good money if I joined their own business which I later discovered was armed robbery. I was given N4000 and a cell phone in my first operation “I accepted gleefully because of the way I saw them spending money. They took me to their first operation on the highway in Abuja and we snatched bags from people and I got N4000 and a smart phone as my share of the loot. I didn’t know how much was made from that operation. Since I was new, I accepted what I got. We also did some small robberies within Abuja and Nassarawa State and after each successful operation, Ava and Nautical usually travelled back to Benue State, where they have farms. I think they were investing more of their loot in farming. But because we were using locally made revolver rifles, we found it difficult executing big operations in Abuja.” From locally made revolver rifles to automatic AK 47 riles “In 2015, after the general elections, luckily, one of Ava’s friends who was used as a political thug, came to Abuja with two Ak 47 rifles which were given to politicians during the elections. He told us that they wanted to join our gang and he would like to work with us. Because he was new in Abuja, Ava and Nautica accepted and took the rifles from him, but one week after then, they told him that some farmers had found the rifles where they were buried in the bush and they have handed them over to the police. They also told the guy that they were going to run way from Abuja because the police were going to come after them. “The guy reluctantly left Abuja and later went back to Benue State. Ava and Nautica joined him in the village so as to make him believe their story. They came back to Abuja after two weeks and called me. Nautical said that now they were ready for big business, but they needed ammunition. Ava contacted a prison official he met during his stay at Kuje Prisons and the official linked him to a mobile police officer who started selling ammunition to us. They sold a round of the live ammunition to us for N400 each and we bought over 150 rounds for our first operation.” How we stole 12 cars from Gold City Estate Abuja “That operation was coordinated by Nautica. He was the one who picked the targets which were first at Gold City Estate, upscale residential estate in Lugbe area of Abuja and he also brought in five other guys increasing our number to eight. On the night of operation, we stormed the estate in a taxi and we scaled the fence and held the security men hostage and we started breaking into people’s houses. The first things we looked out for were keys of exotic cars parked within the estate. Four of the guys Nautica brought would drive the vehicles out of the estate to our waiting buyers in Masaka and once they arrived, trackers on the vehicles would be removed and the vehicles would be taken to Jos and other parts of the country. “The moment the vehicles left we then started ransacking their houses in search of money, jewelries and other valuables. We would only leave when we heard that the police were approaching and we would then escape through the bush in Lugbe. We murdered the herdsmen in their sleep “We robbed that estate for three consecutive times using the same pattern and on each operation we normally left with four of their cars, but in our last operation, while we were escaping through the bushes, in Lugbe, we saw about six Fulani herdsmen sleeping and as we approached them, Ava ordered we should kill them all because they were the ones killing our people in their farms in Benue State. I was carrying one of the locally made rifles and we rained bullets on them in their sleep, killing all of them. “I felt no regret killing those people, because they were also very ruthless. After that operation, I traveled home, but in November of last year, Nautica called us and said he has information that there was money in some houses in the Estate in Apo Abuja. We all met in a bar, off Airport Road and when it was almost time, we boarded a taxi that took us to Super Cell Estate, in Inumba District, Apo, and when we got into the estate, we split ourselves into two groups. “I watched helplessly as Ava murdered a pregnant woman in front of her husband. Nautica led a group while Ava and I were in the second group. That night I didn’t know what came over Ava, it was as if he was high on drugs. The first apartment we entered, we met pregnant woman and we demanded for money. She was overwhelmed by fear and we did not know what she was doing and Ava screamed at her and she brought out N150, 000 in N500 denomination and handed over to me, but before I knew what was happening Ava opened fire on the woman and shot her in her private part. I was stunned. He also shot the woman’s husband before we went into the next apartment.” The second apartment “The owner, refused to open her doors and Ava rained bullets on it to force it open but the door refused. We then went through the kitchen and opened the door, and went in search of residents of the apartment. Ava was so angry when he saw the woman. He demanded for money and the woman gave him just N4000. This got him even angrier and he grabbed two of the woman’s children and threatened to kill them and they knelt and begged him. At that point, I said to him and held him that it was okay that we should leave and he said that he wanted to kill the woman. I told him in our language that we have collected some jewelries and that the woman may not have money in the house and that people don’t usually keep money in their houses anymore. “He then turned around and ordered all of us out of the house and said that if we refused, he was going to kill us. I obeyed him because I knew he could make good his threat because of his powerful charms. As I stepped out, I heard rounds of gun fire and I thought Ava may have killed the woman because she gave him N4000. I also heard gun shots from the other apartments Nautica was robbing and I also felt that they might have killed some of the residents who didn’t obey their orders immediately. When we left the estate, I was filled with guilt for taking part in such carnage. I sold our AK 47 rifles to a community leader in Jos. “Few days after that operation, news came in that Ava and Ogbona Chidubem have been arrested, then I sensed trouble. The Ak 47 rifles were in my possession, I quickly took two of them to Jos, plateau and sold them to a community leader who said he needed them to protect their community. I met the community leader through somebody introduced to me by one Ola, who received some of our stolen cars. I sold the rifles to the community leader for N600, 000 and I also bought 50 live ammunition from one Rabo who was supplying arms and ammunition to people in Jos. I didn’t know how the police knew where I was, they stormed my house and apprehended me”. Rabo’s Confessions Meanwhile, when Saturday Vanguard spoke with Rabo Yakubu, a native of Bauchi State, he denied being an arms dealer, stating that he got the arms he sold to Stigma during a Boko Haram raid in his State. He narrated that some Boko Haram insurgents attacked his home town in February 2015 and while they were being repelled by the military and local group, he stumbled on a bag containing ammunition. “I had the ammunition with me for a long time and I didn’t know what to do with them and when Small called to say that he had someone who wanted to buy ammunition, I took it to him and sold it at N300 per one. I didn’t know that he was an armed robber. I thought he was going to use them to protect his farm,” he stated.